U.S. Guns Blamed For Fueling Violence In Mexico Many Mexican politicians view the current drug war -- which has claimed roughly 30,000 lives over the past four years -- as one more curse foisted on Mexico by their rich neighbor to the north. 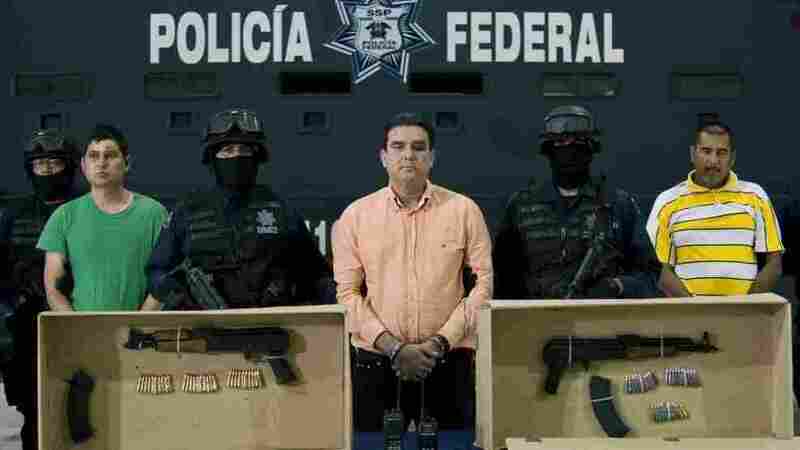 Many Mexican politicians view the current drug war -- which has claimed roughly 30,000 lives over the past four years -- as one more curse foisted on Mexico by their rich neighbor to the north. In this worldview, the incredibly violent conflict is fueled by U.S. demand for narcotics, fought with weapons from U.S. gun shops, and funded by U.S. cash that flows freely across the border. At the chamber of the Mexican Senate, Sen. Sebastian Calderon Centeno says the United States hasn't done anything to curb demand for drugs or to diminish the flow of guns into Mexico. He says the drug war is actually increasing weapons trafficking. The criminals are getting desperate, he says, and are trying to get more and more guns to attack the Mexican government. The senator says most of the guns in the hands of Mexican drug traffickers are bought legally in Texas, Arizona and California. And, he says, the U.S. has little incentive to stop the smuggling. "This is a growing business in the U.S.," Calderon says. "They are in the gun sales business, and it doesn't benefit them to stop." Just this week, the Mexican ambassador to Washington again blamed lax American gun laws for fueling the drug conflict in Mexico. Ambassador Arturo Sarukhan also said the U.S. could do more to limit the sale of weapons that eventually end up in the hands of the cartels. "The founding fathers didn't draft the Second Amendment to allow international organized crime to A: illicitly buy weapons in gun shops and gun shows; B: illicitly cross them over an international border; and C: sell them to individuals of a country where those calibers or types of weapons are prohibited," Sarukhan said in a speech to the Council on Foreign Relations in New York. The U.S. needs to be involved in fighting the cartels along with the Mexican authorities, he says. The only way that Mexico has a chance of winning this battle is with sustained efforts from both sides of the border. "But if we can't fundamentally ... modify the current flow of weapons and bulk cash that are coming from the U.S. into Mexico -- and which provide the drug syndicates with their firepower and their ability to corrupt -- it will be a very taxing challenge," Sarukhan says. Mexican President Felipe Calderon also continues to call on the U.S. to crack down on weapons heading south. There have been recent successes in gun seizures at or near the border. This summer, police in Texas got a tip that two men in a truck were moving a cache of weapons through Laredo. The authorities found 147 assault rifles and more than 10,000 rounds of ammunition in the vehicle, which they believe was headed for Mexico. But the perception here remains that the drug cartels continue to be able to buy weapons unfettered north of the Rio Grande.